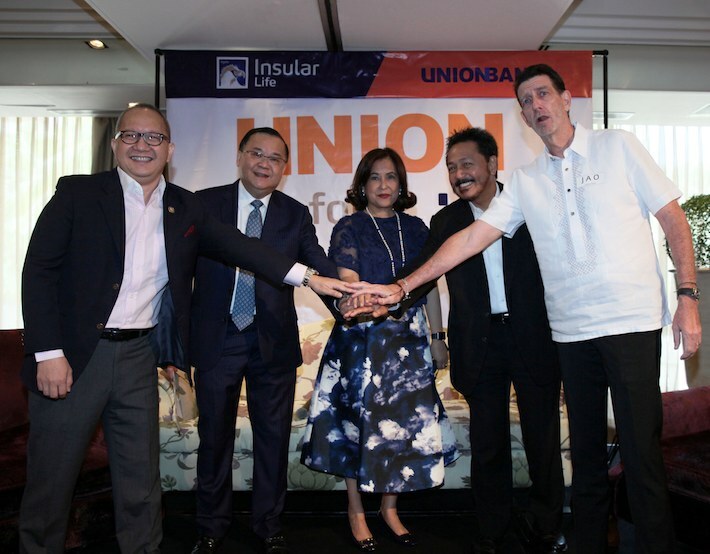 Insular Life and UnionBank formally launched their bancassurance partnership, Union for Life, in a press briefing held on May 10 at the Makati Shangri-La Hotel. In photo are executives from the two companies, from left: UnionBank (UB) Sr. EVP for Retail Banking and Corporate Banking Eugene S. Acevedo, UB President and COO Edwin R. Bautista, Insular Life CEO Nina D. Aguas, Insular Life SEVP and Chief Bancassurance Executive Omar T. Cruz, and UB Chairman and CEO Justo A. Ortiz. Largest Filipino life insurance company, Insular Life and Aboitiz-led UnionBank of the Philippines received the approval from both the Office of the Insurance Commissioner and the Bangko Sentral ng Pilipinas to enter into a bancassurance distribution partnership, to boost both companies’ revenue streams. Last January, the two companies jointly announced their plan to enter into a bancassurance partnership, believing in the synergy that will create better value for their respective stakeholders. Insurance Commissioner Dennis B. Funa expressed his confidence that this partnership will help promote a more robust life insurance industry and increase the insurance penetration in the country in the long-term. “The Insurance Commission is happy to give our stamp of approval to this bancassurance partnership between these two highly respected institutions because such partnership will surely help improve our country’s insurance density and market penetration. This in turn will help make our country’s average insurance penetration rate comparable with the more progressive ASEAN member states,” Funa said. Under the bancassurance distribution partnership, UnionBank and its wholly-owned subsidiary, City Savings Bank, will distribute and sell the insurance products of Insular Life to its over six million bank clients spread across UnionBank’s group network of over 300 branches and offices. “We at UnionBank are very delighted to have received the regulators’ approval so that we can begin offering insurance products to complete our product suite to our bank clients to help them better achieve their financial goals,“ said UnionBank President and Chief Operating Officer Edwin R. Bautista. “As with any partnership, there is no greater feeling than that of finding the right Bancassurance partner and together, offering products and services which impact Filipino families and communities in a profound way. For us in Insular Life, that's UnionBank,” said Insular Life Chief Executive Officer Nina D. Aguas. “We were in search of a bancassurance partner who shares our values. We have a long tradition of steadfast commitment to our policy holders, a respected Filipino company in a Philippine industry dominated by foreigners. UnionBank is also a proud Filipino company, recognized internationally, as among the best of class in global league tables. Together, we will continue to create value for the stakeholders of our two great companies and assert leadership in our respective industries”, Aguas added. For this bancassurance business, Insular Life will provide a differentiated model for UnionBank – tailored to fit the Bank’s Customer segmentation. Omar T. Cruz, former president of a bancassurance joint venture, and former Philippine National Treasurer was appointed senior executive vice president and head of the bancassurance operations.